Moving on from Uzbekistan, I was still not feeling completely fresh. I decided on taking on the mountains anyway. I started cycling towards the Tajik border, and though I was taking it slow, it felt all right. Just as I entered Tajikistan, a boy cycles up besides me. He asked me whether I had seen his village. Obviously, I hadn’t, and agreed to come with him to see it. Turns out he lived right by a UNESCO site, being one of the oldest settlements of the region. He was extremely knowledgeable, as he wanted to study to become an archeologist himself. Eventually, he invited me to his house for dinner. I went to meet his entire family, and after hanging around for a couple of hours, his mother came to serve the dinner. She didn’t actually eat with us though. Apparently, it was a men’s only dinner. The food was delicious, and they insisted I stayed for the night as well. I hadn’t cycled very far that day, so I declined the offer and kept cycling. I made it to the town of Panjakent. That night, I started feeling even more sick, and before I knew it, I was making regular runs to the bathroom vomiting. I guess the food might have been a bit dodgy after all. Every single traveler I have spoken with have gotten sick in Tajikistan. It seems unavoidable. The country has very little tourism in general though, and most of the western people I saw were UN and NGO workers driving massive white Land Cruisers. I stayed in Panjakent for a while recovering from all the vomiting. When I finally got going, I got sick after the first meal I ate again, and once again I was stuck in the middle of nowhere recovering. My body was feeling weaker than ever, I was dehydrated, and I had a cold, snowy mountain pass to cycle. I was simply not up for it, so I chucked my bike on to the roof of a taxi and drove over the pass to the city of Khujand. In Khujand, I checked in to a proper hotel, and was very picky with my diet. I went to the hospital that same night. The hospital in Khujand felt more like going to the bazaar. I found doctor and realized that not a single person at the hospital spoke any English. I awkwardly tried to gesture my symptoms. He sent me off to a room down the hall. I entered the room to find a grumpy looking woman sitting by a desk in the middle of an otherwise empty room. Empty, except for all the other patients standing in there. Publicly, you would be expected to tell her about your symptoms. With the help of another English-speaking patient, I got the message across. She sent me off to the infection’s clinic at the other end of town. This part of the hospital was a lot more pleasant, though still very basic. I came in to speak with no less than 3 doctors. They measured my temperature, concluded that I did not have a fever, yet wanted to hospitalize me for three days. I really couldn’t grasp the idea of hospitalizing me with no apparent symptoms, so I insisted on bringing home a bit of medicine instead. They ended up prescribing antibiotics, probiotics, and some sort of enzyme. After a couple of days of munching pills, my symptoms cleared up. The hotel I was staying at was completely new, and for that reason they were very eager for a bit of advertising. At one point, the reception called me up. They told me they wanted to do a video-interview with me about the hotel and the city. I agreed and went down to the reception. I came down to a man with a camera, was hooked up with a mic and lights. At this point, it started getting awkward. Our ideas of an interview were somewhat different. As I was standing there with a camera in my face expecting a few questions, I was told to improvise a sales speech for the hotel. They wanted me to keep speaking for at least one minute. The people with the camera didn’t actually speak any English, so they didn’t have a clue what I was saying. I came up with a short speech and went back to my room. After a short while, the English-speaking receptionist came to my room and told me they would like me to redo it. Apparently, they weren’t quite happy with my performance. They showed me a video of and American actor praising the hotel to the skies in a clearly well-prepared speech and told me to do something along the lines of that. I couldn’t help myself but to burst out in laughter. I gave it a few more tries, but eventually, they seemed to give up on me. They did, however, give me a bit of chocolate as a reward for my effort! Alien landscape leading out of Khujand, towards Kyrgyzstan. As I cycled on from Khujand, it didn’t take long for me to make it to Kyrgyzstan. I woke up to a cold, grey, Sunday morning in the southern Kyrgyz village of Kadamjay. I had planned on cycling halfway to Osh which would be a short 70 km ride. Given the sub ideal weather, my motivation was at a bare minimum. I’d only just started cycling when I was passed by a flatbed truck with two medieval looking horses fixed to the back. They were dressed up in blue rugs and were equipped with metal-framed saddles and a sturdy handle for the rider. As I cycled on I was passed by a few more horse-loaded pickups before eventually, I was the one passing a truck. A few men were loading up their horses, preparing to leave. I approached the guys to have a chat. “What’s with all the horses?”, I asked. I knew perfectly well what they were up to, but it felt too good to be true. I’d been wanting to see these horses ever since I left home half a year ago. One of the men looked up at me, smiled, and told me, “Ulak”. Ulak Tartysh, as it’s known in Kyrgyzstan, is a horse-mounted game played throughout Centralasia. In Afghanistan, the game is known as Buzkashi, which translates to “goat-pulling”. The game is best described as a form of polo, except the ball is replaced with the carcass of a goat. Among travelers, it is often referred to as Dead-goat-polo. Two main variations of the game are played. Qarajai is the more complicated version, played by two opposing teams. To receive a point, the goat must be thrown in to a scoring circle. The team with the most points at the end of the game, wins. The simpler version, Tudabarai, is a free-for-all battle royale, in which the only objective is to separate yourself and the goat from the remaining players. By doing so you are rewarded with either a point or a material prize. Riders fighting for the goat - notice the whips in the mouths. Hands must be free to grab the goat! We went to the nearest hotel, dumped my bike, and got into some warm clothes. Apparently, we were going halfway in to the mountains, and it would be cold. I got into his car, and we set off out of town. The roads were rapidly deteriorating, while more and more horse-mounted men were showing up. In the distance we could see a massive cloud of dust rising from a black mass on a sloping field. This was the game of Ulak we were going for, and it was quite obviously played in the form of Tudabarai. As we neared the field, I stepped out of the car and was surrounded by riders ready to go play. A group of about 200 players were all circled around a single point on the field, where one could only imagine the sorry carcass of a goat to be. In the center of the horde, madness was unfolding. The few players lucky enough to be near the goat were fiercely whipping and yelling at each other as the horses were prancing, desperate to escape the chaos. Occasionally, a horse would start galloping at full speed to liberate itself from the claustrophobia, with the rider holding on for dear life, only to be forced right back in. As a spectator, you would obviously be observing the games at a distance for your own safety. Often it seemed as though the game had come to a halt, until someone finally escaped with the goat in hand, chased by the thunder of a 200-horse group at full speed. Players could join and leave the game as they liked, so exactly how points were being counted is beyond me. Among the crowd of spectators were horses preparing to go play. 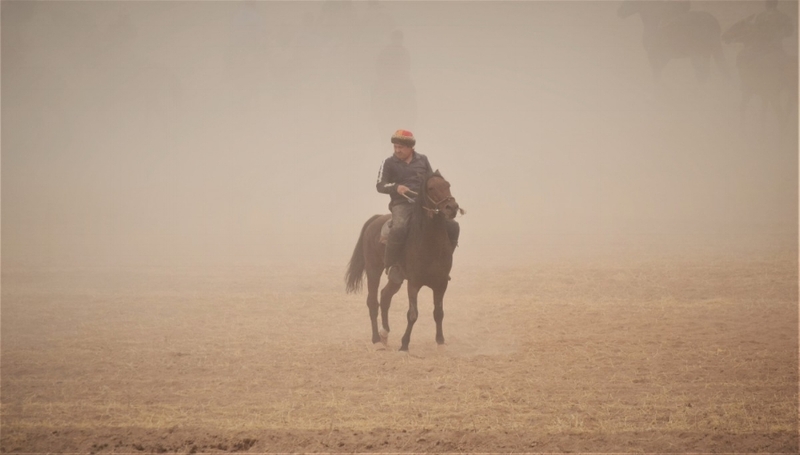 The riders were mostly dressed in thick layers of clothing and heavy-duty boots to protect themselves from whips and crushed legs. Many were even wearing old soviet tank helmets. Every now and then, the main referee would call out for the goat. Whoever brought it to him would receive a prize in the form of a lamb. The first prize, given to the player with the most points at the end of the day, was a car. Ulak player - notice the old soviet tank helmet on his lap, and the thick boots. Toned down versions of Ulak are showcased for tourists by the Tourist Association of Kyrgyzstan. The authentic Ulak is very much a village game though, and foreigners therefore very rarely come by these massive, free-for-all brawls. For that reason, I felt like more of an attraction than the actual games at times. I was even pulled in by a local tv-station to do an interview, with Ulan nervously translating on screen with me. They even offered to rent a horse for me to go play. Though the story would’ve been great, I kindly declined, only to be passed by a 12-year-old on a donkey coming right up from the field. After enjoying the spectacle for a good hour, Ulan tapped me on the shoulder and told me it was time to go. He was not comfortable with the amount of attention we were getting. Though I would’ve loved to stay, I didn’t question his decision. We went back to his car and drove off to his parent’s house where I was gifted a traditional Kyrgyz hat by his mother. We finished off the day at a nice restaurant to warm up on Camca and tea. He dropped me off at my hotel, shook my hand, and that was it. If the idea of “dead-goat-polo” doesn’t really appeal to you, the Kyrgyz hospitality in itself would be reason enough to pay this amazing country a visit. But if you do get the chance to witness a game of Ulak, do it, and you might just change your mind. The day after, I cycled my way in to Osh. Osh is honestly not the most charming of cities, but it was time for a bit of rest before tackling the Pamir mountains. In Osh, I met Matt and Becky whom I crossed the Caspian Sea with several weeks back. They had just been rescued from the cold of the mountains I am now planning on heading up to. The weather seems to be getting better at the moment though, so maybe it might just be possible for me to cycle. If not, I guess I’ll have to go on a bus or a taxi once again. Anyway, I am very close the halfway point of my trip. I have estimated Kashgar in China, which is the next major city, to be the halfway point. Needless to say, I’m pretty excited to get there. For now, I have to prepare for the cold. I’m cycling for the Association for Greenlandic Children. They’re working for a great cause, so If you haven’t already, please do consider donating or spreading the word! You can read about their projects and my motivation for supporting them through the link below. Thank you!